Licensed technical mountaineering guide by the Idaho Outfitters & Guides Licensing Board operating in the Sawtooth National Forest & Wilderness Area, Salmon Challis National Forest, Boise National Forest Mountain Home District, City of Rocks National Preserve, Bogus Basin backcountry, and the newly obtained permit for the Dierkes Lake/Auger Falls (Twin Falls). 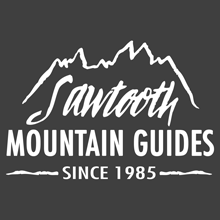 Sawtooth Mountain Guides offers hiking, multi day backpacking, introduction to rock climbing, climbing trips, alpine climbs (technical and non technical), and the Canyon Camp (located on the west side of Red Fish Lake near the Elephants Perch and Super Slabs). JP works with clients to determine goals for the trip. Responsible for the mitigation of hazards related to given activities while maximizing client rewards. Lead alpine climbs, some involving short roped sections through 4th class terrain. Instruct numerous climbing programs for children and adults. Document anticipated hazards, weather, clients’ information/skill level, objectives including terrain usage, time control plan, and alternative routes. Book me for a trip today with Sawtooth Mountain Guides! Click on image to discover the SPLITTER granite!